Our first drop of Trelise Cooper Summer 09/10 has arrived! And has not disappointed! In true Trelise style her collection this summer is colourful, luxurious and as always borders on the avant garde. She has the amazing ability to bridge the gap between clothing and costumes, creating a look that all little girls (and their mothers) adore. 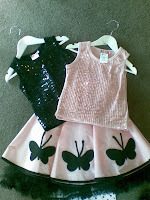 The divine 'Shimmer of Hope' sequinned tanks in ballet and black have arrived and go back beautifully with the 'Groovers and Shakers' tulle tiered skirt also in ballet and black. We have popped these in the window and as always with Trelise they have caused much conversation and a bit of a buying frenzy! We have also received our first drop of Big & Fiona by Fiona Scanlan. Consisting at this stage of stunning kaftans in white & raspberry and funky 3/4 pants. These are stunning together or can be mixed and matched with the Fred Bare basic denim. Stay tuned for further updates! We are due to get a couple of big drops over the next week or so and are very much looking forward to receiving the much anticipated first drop of Two Belles & Tommy Rocket Summer 09/10.